Documentary photography usually refers to a popular form of photography used to chronicle significant and historical events. The photographer attempts to produce truthful, objective, and usually candid photography of a particular subject, most often pictures of people. As we described in yesterday’s blog, we have been participating in the WPO London Documentary Photography Project during the last four days. With Friday’s Royal Wedding as the backdrop, we were encouraged to try and capture the mood of the day and create surprising images; an alternative documentation of the day’s events. The project was led by renowned British Photographer Jocelyn Bain Hogg and with his assistance we chose one image each to put forward for the World Photography Organisation exhibition at Somerset House, London. The exhibition is now on and will run until 22nd May 2011. This image by Andy was taken amidst the celebrations in Hyde Park. Over 120,000 people flocked to the park to watch the ceremony unfold on the big screens, and many arrived in costumes and full picnic baskets. Champagne seemed to be the drink of choice for many and why not! 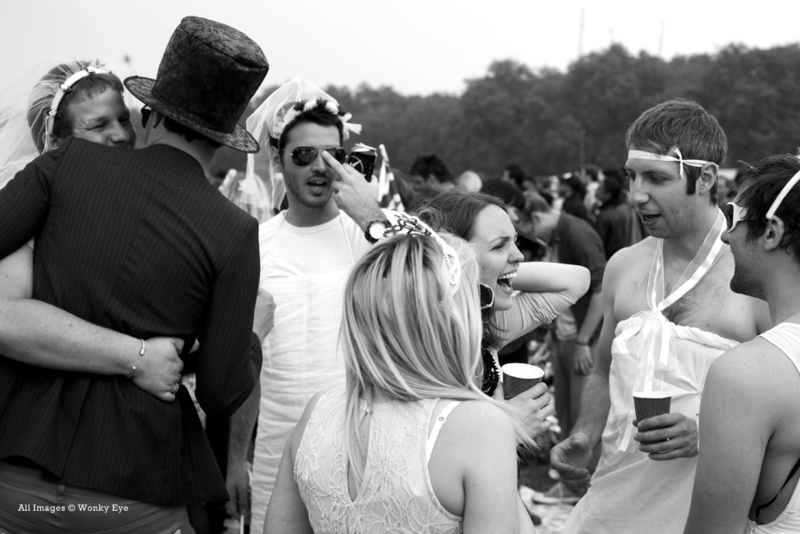 The atmosphere was euphoric and Andy captured this image of a group of friends enjoying the occasion. This photo was taken by Michelle, also in Hyde Park. The image captures the intensity of the day. After the ceremony the party got into full swing, music pumped from the speakers and the crowd danced where ever there was an uncluttered patch of grass. The long day obviously took it’s toll on these Spanish students who slept as in a jigsaw puzzle.